I first saw the new UJK router table at the High Wycombe branch of Axminster Tool Centre a day after it first went on display. Axminster is currently rebranding its own machinery and the UJK Technology brand with signature bronze colour is part of that process. The table consists of a sturdy and nicely finished steel frame sitting on two fixed wheels at one end and a retractable castoring wheel at the other. 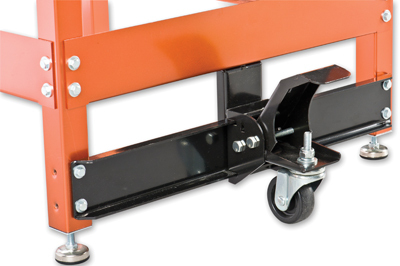 This is foot operated and makes the table easily moveable. All four legs have adjustable feet and there are two low-level storage rails drilled to hold router bits. Personally I wouldn't fit these as having sharp unprotected router bits at low level near where I would be working is not that practical. There is also a storage bracket for the mitre fence so it can be kept safe when not in use but still close at hand. The top is cast iron measuring 812 x 610mm with a superb ground finish; I did detect a tiny indication of convexity along the length, probably due to relieved internal stress after machining. It is 930mm high but this is adjustable. There are two T-slots - 20mm and 10mm - which are also nicely machined and my Kreg feather boards fitted with ease. The opening fits the UJK insert plate or UJK router elevator but not the insert plate I took with me, so I had to use a DeWalt setup provided by the Axminster team rather than my own Trend T11. The experience was a minor inconvenience given the location but wouldn't it be nice if all manufacturers could agree a standard size! Incidentally the UJK insert bolts securely into the table and is a feature you usually do not find and one I think highly desirable. The table surface is low friction and will allow the use of magnetic attachments. The fence is a one piece aluminium extrusion with a bronze anodised finish. It is secured at each end to brackets with imperial and metric adjustable scales so you can set up zero relative to cutter centre, cutter front edge or any other datum. I used a steel rule with a Veritas ruler stop to set the fence parallel to the front edge of the table and the mitre slots; it's very easy to do. 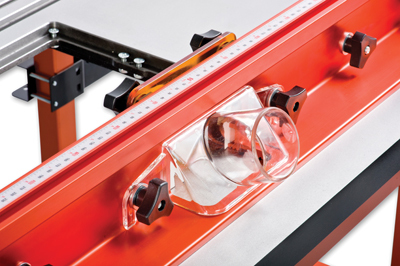 The infeed and outfeed sections of the fence have a melamine-faced board attached to them that are easily adjusted to minimise the gap around any cutter. There is no provision to fit a secondary false or breakthrough fence. There is, however, a T-slot located above the timber facings which is slightly set back from the melamine face so anything attached such as a feather board could be pulled over at an angle. This could be corrected by the introduction of a shim or washer. On the back of the fence is a plastic hood with a 62mm diameter connection for extraction. In the tests I did, the extraction worked as well as any other unmodified table I have used. A UJK router enclosure is available for a modest £62.83 and this is said to improve extraction; it could also slightly lower noise levels. The mitre fence on this router table was a good fit in the 20mm slot and features a washer at the front end so it cannot lift out; a very useful safety feature. There was little play and most users should be happy with this for the majority of jobs. I also tried my own Kreg Precision mitre fence and this ran along the slot superbly due to the plastic screws used to counter any slack. The mitre fence does have a couple of problems, however: it cannot be used close to the fixed fence without removing the cutter guard and the face was slightly off vertical. I doubt this would cause any real issue in use. Doing a few trial cuts on some teak showed the table to be stable and not prone to the levels of vibration I was expecting. I did not try a large panel raising cutter but I suspect the weight and solidity of the table would make this a nicer experience than with a lesser structure. Setting up the fence for depth of cut was a joy and overall, I was extremely impressed. This new design with its cast iron table and steel legs is not cheap at £459.61 and it begs the question: is it worth it? The answer has to be yes, although, by the time you add a drop-in mounting plate - £50 - and a decent router like the Trend T11 - £320 - you are up to £830 and fast approaching the cost of an entry level spindle moulder. Step up to the newly revised Axminster/UJK router elevator in place of the standard insert plate and the total cost is close to £1,000. This should be a consideration as it is far easier to make height adjustments above the table than from below. 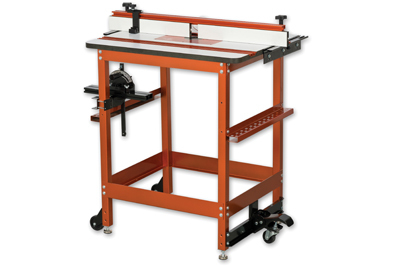 So is this set-up preferable to a spindle moulder? Well, the first thing to mention is that you can still use the router free-hand and as many people will graduate from this activity to a table, they will already have a selection of cutters. 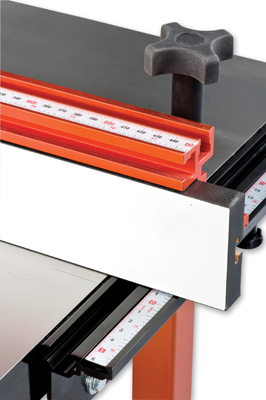 Move over to a spindle moulder and you begin buying tooling all over again; a logical solution if the scale of your work requires it and if you are turning out repetitive quantities of mouldings, but for the rest of us a good table and router combination gives lots of flexibility. Like a good spindle moulder this table will last a lifetime. In short, it iss the best router table I have tried: solid, accurate and high quality without fiddly gimmicks.